Macon County has up-to-date medical facilities-including two hospitals, a county health center, a sports medicine facility specializing in orthopedics, a rehabilitation center and two nursing home facilities, with the Highlands-Cashiers Hospital also providing services in that field. Home health care is also available. Angel Medical Center is a full service, nonprofit, hospital, located at 120 Riverview St., Franklin, North Carolina. We are a modern, multipurpose acute care health facility that has been serving residents of Macon County for more than 70 years. Our organization is committed to patient satisfaction and service excellence. Angel Medical Center also operates Angel Urgent Care located at 195 Franklin Plaza. The center treats non-emergency medical problems when your regular doctor is unavailable. Highlands-Cashier Hospital provides acute medical care, including both 24/7 emergency room and surgical coverage. In addition to a wide range of diagnostic services, the hospital provides long-term skilled and intermediate nursing care and rehabilitation services to patients through its own short-term rehab program, as well as the Eckerd Living Center. WestCare Health Systems is a non-profit health care provider that delivers a full spectrum of health care for over 80,000 people living in four counties. 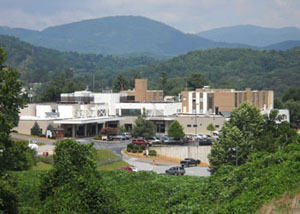 WestCare is comprised of two hospitals, Harris Regional, located in Sylva, and Swain County Hospital, located in Bryson City. Macon County Public Health Center serves all Macon County residents and is located in the Human Services Building at 1830 Lakeside Dr. (just off the Lake Emory Road). Please call 349-2081 to find out if the services you are interested in require an appointment. The Asheville VA Medical Center staff's the clinic with three primary care physicians and two mental health physicians. Approximately 27 individuals are on staff at the clinic, including a pharmacist, social worker, nurses, optometrist and ancillary personnel. Located at 3195 Old Murphy Rd. The center is a 200 bed nursing facility. The firm is NC licensed and certified for Medicare and Medicaid, Veterans Administration and managed care organizations. Macon Valley offers all levels of nursing care along with a specialized unit for rehabilitation therapy. Located at 150 Crisp Street. Grandview Manor has been offering assisted living care since 1968. The facility is privately owned, 82 bed home, and is licensed in NC. Call 828-524-4425. The center has a 24 hour experienced staff, a special care unit serving dementia patients, planned activities, fine food, transportation, and cable TV. It located near the hospital and downtown.